Written and directed by Matthew Brown, “The Man Who Knew Infinity” is based on a true story. An art house/international drama opening May 13 in select Dallas area venues, the film is distributed by Edward R. Pressman Film Corporation and runs 1 hour 48 minutes. Rated PG-13 for some thematic elements and smoking. This film tells the little known but poignant story of a surprising friendship. 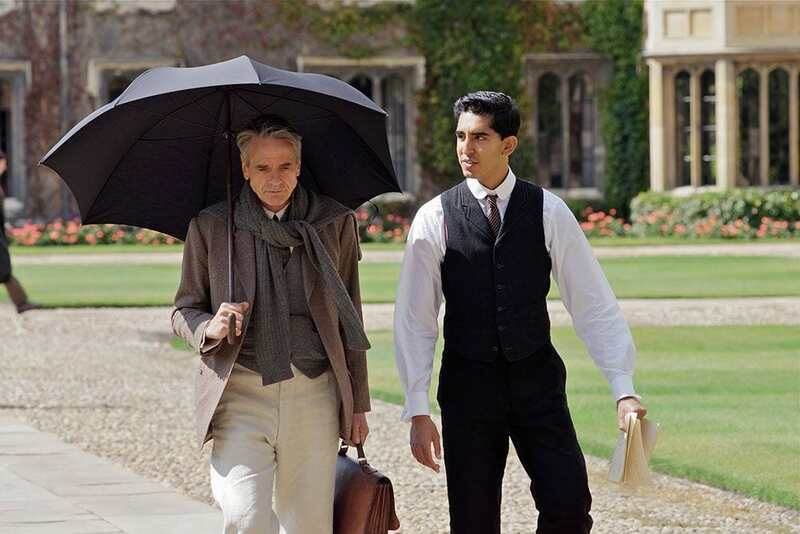 Two very different men: Cambridge’s Trinity College Professor G. H. Hardy (Jeremy Irons) and Indian math genius Srinivasa Ramanujan (Dev Patel) first met in 1913. Hardy was an eccentric loner who grew to trust his uneducated protégé’ as their collaboration and research forever changed mathematics. “The Man Who Knew Infinity” tells their story as seen through Hardy’s eyes following Ramanujan’s early death at age 32. This is a very poignant film, which sheds light on the extreme racial prejudices of that era. Apparently it was the norm for most British academia to feel themselves superior to anyone who wasn’t born Anglo-Saxon and privileged like they were. Championing an uneducated 25-year-old shipping clerk from Colonial India in 1913 did not make Professor Hardy popular with his fellow professors (two of them played by Stephen Fry and Toby Jones). The film also stars Devika Bhiseas as Janaki, Ramanujan’s young wife. He was forced to leave her behind in India to attend college. For five years Hardy and Ramanujan tried to convince faculty members that these mathematical theorems were correct, even though the young math genius arrived at them by an unconventional method. Thanks primarily to the efforts of Professor Hardy, Ramanujan was named a Fellow of the Royal Society not long before his untimely death. Ramanujan compiled nearly 3900 results (mostly identities and equations) during his short life; almost all have now been proven correct. While watching a film about an unusual friendship between two math researchers may not sound exciting, this is one of the best films I’ve seen this year. It’s not only beautifully acted but has an inspirational message about overcoming class prejudices.